At , we believe in our products. That's why we back them all with an 18-month warranty and provide friendly, easy-to-reach support. This review contains technical observations which I have reported to Anker. Although they have responded to some of them, they have not yet addressed all of my questions. This review will be updated as answers to these questions come in. Curious about the build quality and what's inside? Me too, and I destroyed a battery so you don't have to, and at full price! Overall, Anker's build quality these days is pretty gosh darn good. Machined aluminum with an anodized finish, and tasteful silk-screening that complements the look and feel of the product. 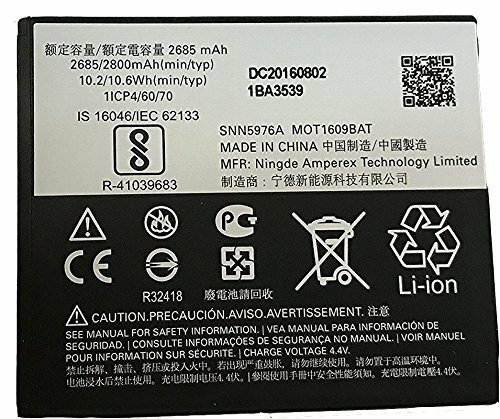 The battery I opened was verified to contain a high quality Panasonic-Sanyo NCR18650BF Lithium Ion cell, which is one of the finest cells available on the market today. 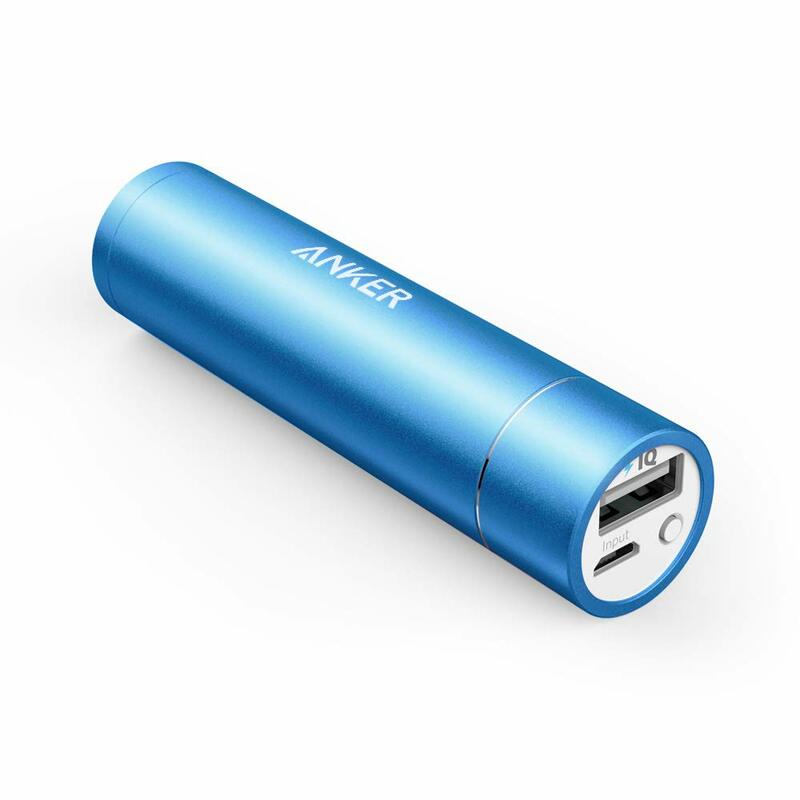 Anker has clearly put a great deal of work into creating a fantastic product at a fantastic price. Unfortunately, I observed a number of inconsistencies in both order fulfillment and product performance, which I believe Anker will work to resolve ASAP, at which time I will update this review accordingly. It is important to note that the battery industry is chock-full of snake oil, shams, and scams. Even with the difficulties that I observed, I am convinced that Anker provides products of better quality and consistency than most (if not all) of the competition as any "problems" that Anker may have are generally much worse with other vendors I've worked with in the past. - Inconsistent Performance of Internal DC Boost Converter Between Batteries, Affects Output Current and Capacity, Actual Available Capacity Varies Between 8.5Wh and 9.5Wh. - Possible Inconsistent Quality Control - Based on my numbers Anker deemed 2 out of 4 batteries to be possibly defective and shipped replacements (not arrived at time of this writing). IMPORTANT!!! DO NOT USE CHEAP, THIN, OR LONG USB CABLES WITH EXTERNAL BATTERIES. YOU WILL WASTE UP TO 40% OF YOUR POWER! I'm a bit of a voltnut. I care about the stuff that most people don't. When it comes to batteries, I want every watt-second I can squeeze out of a cell. Unfortunately, the battery industry is full of lies, treachery, and deceit. Manufacturers are incentivized to fib here and there because now everyone shops by the numbers. People expect the numbers to be highly accurate, and don't realize how complicated modern batteries can be, how often vendors lie about specifications, and how often cells are counterfeit. I've become so jaded over the years that I now expect most vendors to lie until proven otherwise. 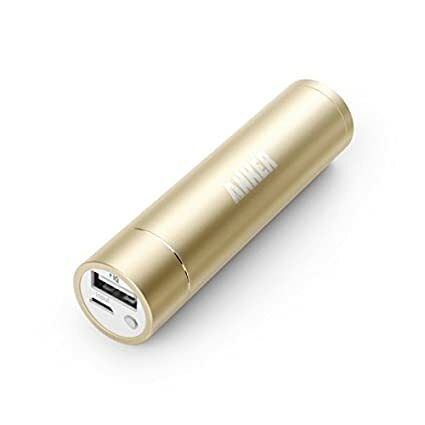 That's why when I saw Anker advertise a 3350mAh USB battery for 9.99USD including shipping, I assumed it was too good to be true. 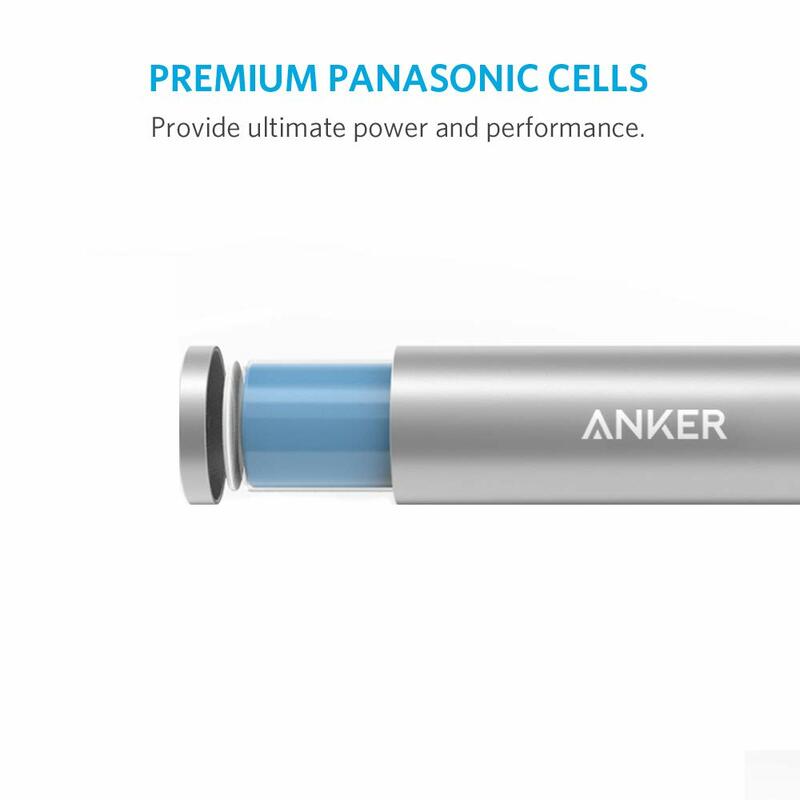 It wasn't until I saw Anker advertise its "Premium Panasonic Cells" that I became truly curious and decided to not only buy some batteries, but resigned to tearing one of them apart in the name of science! For load-testing the batteries I am using a Maynuo M9712C Programmable DC Electronic Load. When I needed a power source I used a Rigol DP832A Programmable DC Power Supply, and verification of voltage readings was done using a Rigol DM3068 6.5 Digit Digital Multimeter. In order to minimize power loss in the USB cable during whole product testing I custom-built an extra-short USB cable using 22AWG conductors, meaning that all of my numbers will be best-case scenarios for each of the batteries I tested. Real-world numbers will vary wildly depending on the type, length, and quality of cable used (more on that later). Anker generally uses Amazon's fulfillment for almost all of their products, which is smart as it offloads a great deal of logistics and gives hundreds of thousands of customers access to their entire product line using Amazon Prime shipping. Unfortunately, it also means that when there are production changes or revision updates, inventory management gets a bit hairy. Sometimes product ASIN's get mis-coded, sometimes inventory gets mixed up, and other times there may be listing errors that result in the wrong product revision being dispatched from the warehouse. This was the case for me when I ordered two PowerCore+ Mini's in Black last week, and two Astro Mini's in Black showed up, although they were so close to the PowerCore+ in appearance (in fact, they are identical in appearance) that I didn't even notice the error until a couple of days later when during testing I noticed that the tail cap of the battery had "Astro Mini" written on it. 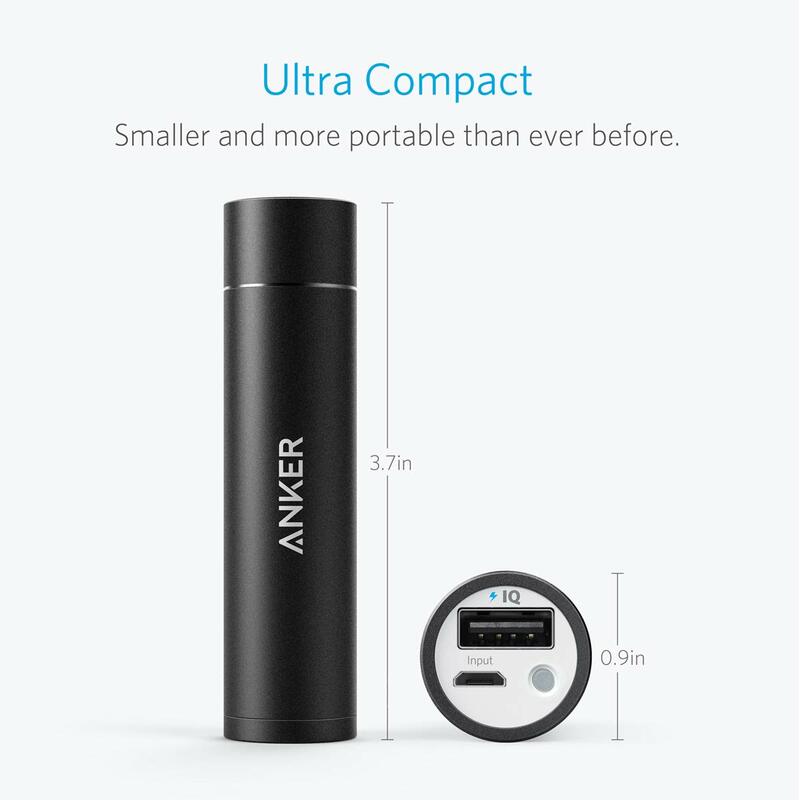 At time of this writing both the Astro Mini and the PowerCore+ Mini are listed as separate products on Anker's website, and share the same capacity ratings, but have some minor published differences. 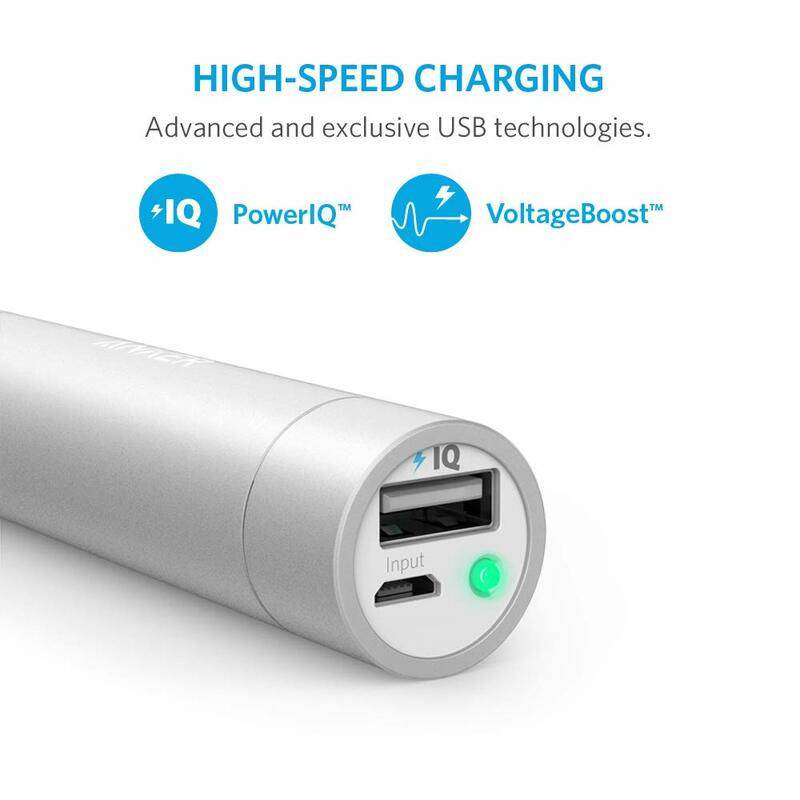 Both are rated at 3350mAh/12.06Wh, and both claim 5V @ 1A output. In fact, the only published difference that I found was a small difference in charge rate; whereas the Astro Mini has a charge spec of 5V @ .8A, the PowerCore+ Mini can be charged approximately 20% faster with 5V @ 1A. 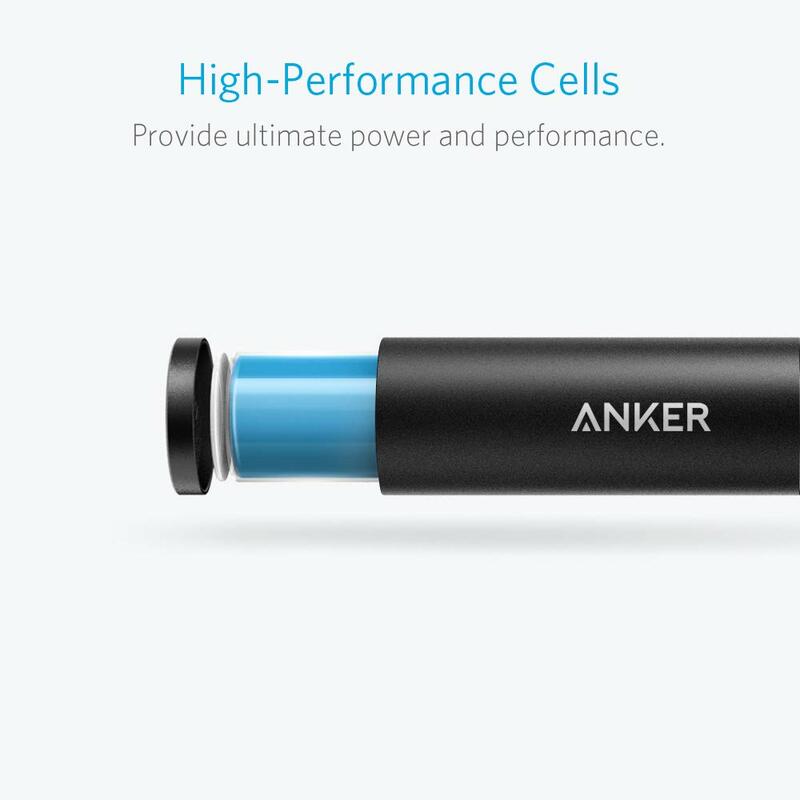 I reached out to Anker's support on Friday to speak with them about the discrepancies, and later that evening, I saw that Anker had split and moved around a number of their listings for the PowerCore+ Mini (and increased their prices for most of their colors by 4USD). 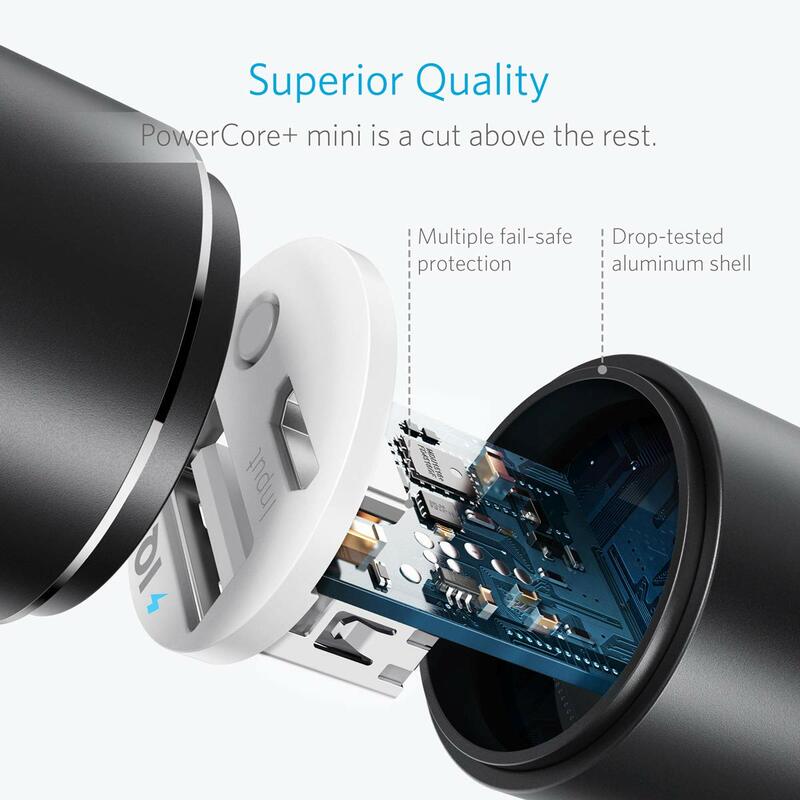 A follow-up call on Monday confirmed that there was likely an error in the listing with fulfillment as while Amazon's system showed that I had ordered two PowerCore+ Mini's, Anker's reported that I had ordered two Astro Mini's. During testing of the Astro Mini's I observed some troubling discrepancies that prompted me to order additional batteries. 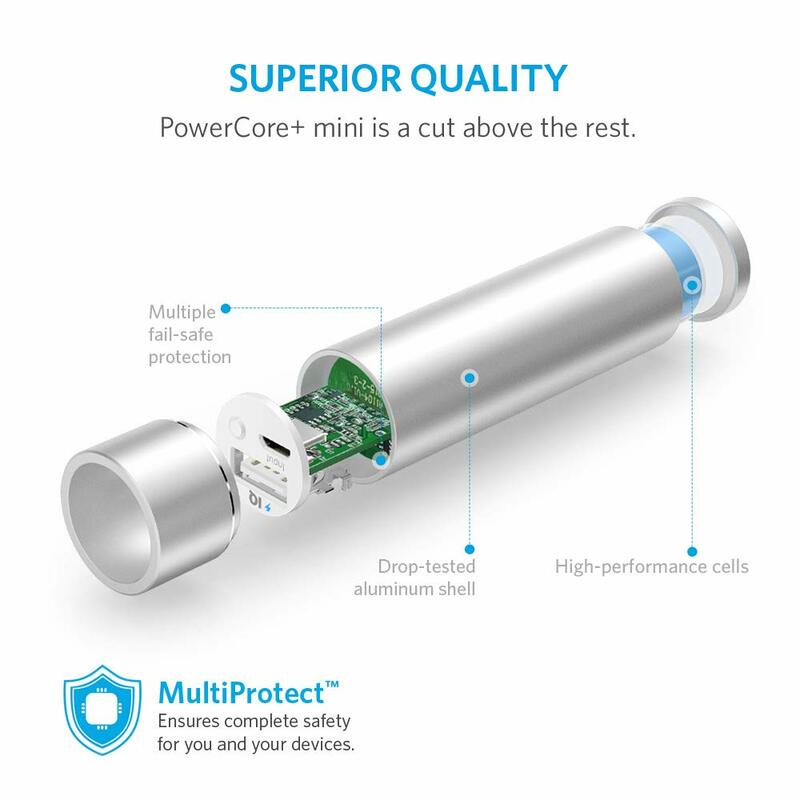 I ordered an additional PowerCore+ Mini in Silver, after the Amazon listing shuffle stopped a couple days later, another in Black. Both the Silver and Black units that I ordered in those ordered arrived correctly marked as PowerCore+ Mini's. I've ordered a number of Anker products in the past, usually USB hubs. Anker's packaging has always been efficient, easy-to open, and well-thought, and these batteries were no exception. I would consider to the box to be perfectly "stocking stuffer" sized. Each battery came with a short Anker USB Micro cable, a tasteful carrying case, and a short and sweet support pamphlet that tells you how to get questions answered or stuff fixed. 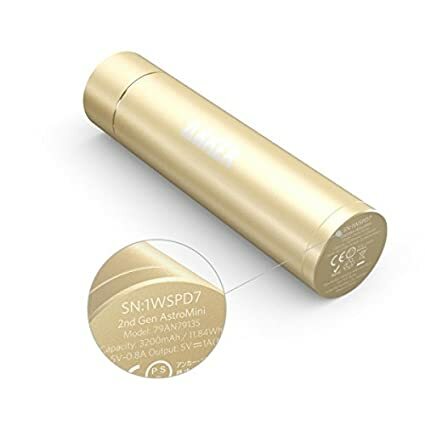 Each battery's USB port is also covered with a sticker to remind you that the battery automatically cuts power to the port to conserve energy when not in use, and that a quick tap of the small button in the corner is all you need to get the juice flowing. "Wow." This was my initial reaction. As I mentioned before, the phone accessory market is often a race to the bottom in terms of quality, and batteries are no exception. Fierce competition on price in markets such as Amazon drive manufacturers to cut corners whenever they can. A few nickels here and there can add up quickly when you think about the volume of product moved. If Anker did cut any corners with the casing of the battery, it doesn't show. 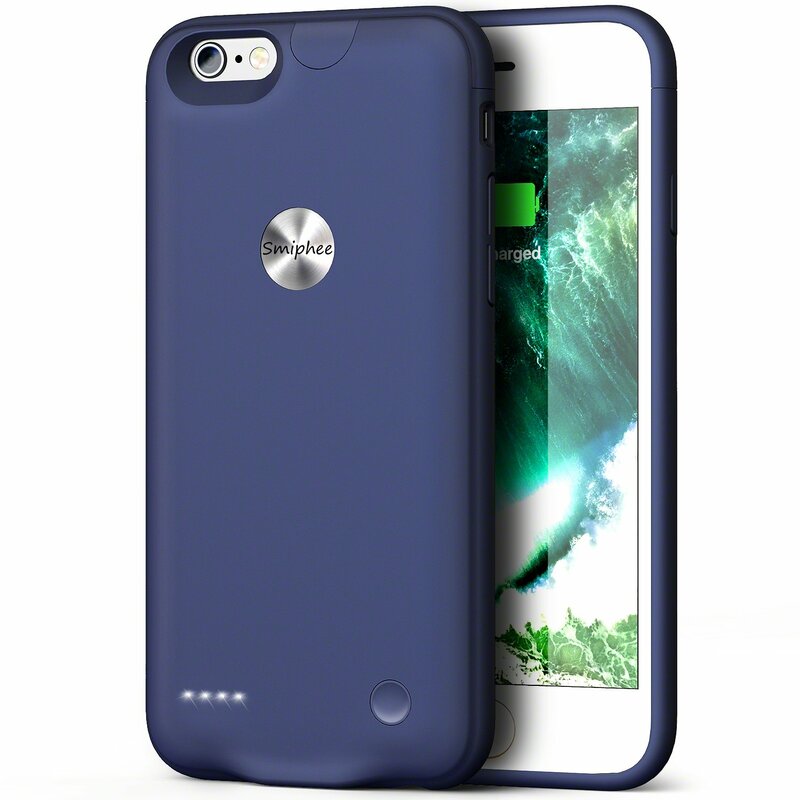 The body is a beautifully anodized, slim, aluminum shell that wraps around the interior cell and electronics. This thing is *rock* solid, and shames all of those cheap-feeling plastic models out there. Why does it matter? Well, just do a quick search for "Lithium Ion Fire" on YouTube sometime and you'll see quickly why the FAA restricts how much lithium you can carry on an aircraft in the form of batteries, and why most major couriers won't allow you to ship Lithium batteries via Air Mail unless you have a hazmat contract with them. Lithium Ion cells can be downright dangerous if mishandled, and you want the hardest, crunchiest shell you can find to safeguard those cells, especially when the battery is this small. 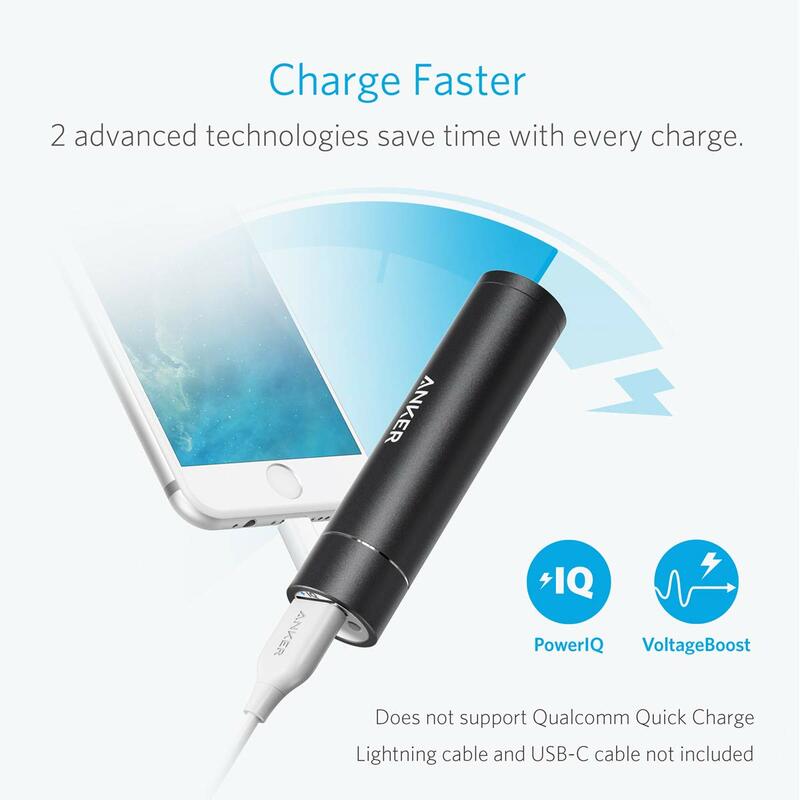 Anker got this 100% right, and for a stellar price. 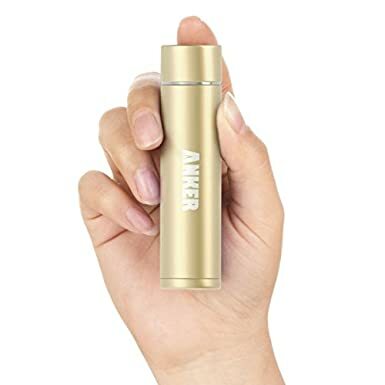 Anker's logo is silkscreened tastefully on the side in a way that doesn't look gaudy, and the aluminum tail cap has detailed specifications silkscreened onto it, including capacity in both mAh and Wh (yay!) and a serial number, which Anker uses in the event of a problem to determine which manufacturing batch it came from. 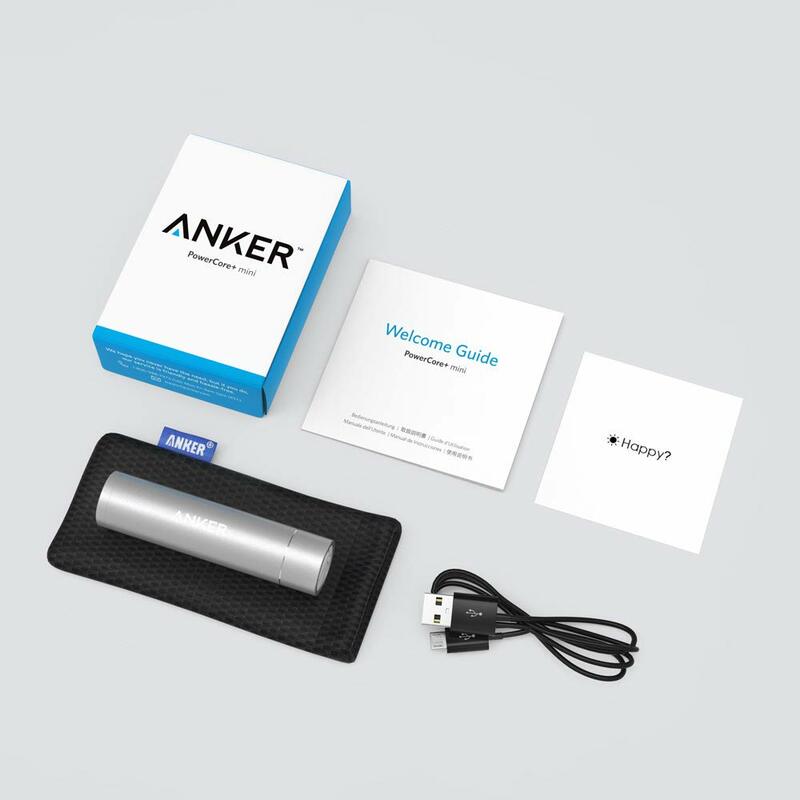 Serial numbers on devices this cheap are the hallmark of a manufacturer that cares because while you are unlikely to file a police report for a stolen ten dollar battery, Anker certainly wants to know which manufacturing batches are having problems, if any. The only visible plastic on the unit is on top, and is done tastefully. The plastic doesn't have that cheap looking "sheen" that so many products today have, and as silly as it sounds, the button feels nice. In fact, everything on the battery looks and feels, nice. What I did here is totally and completely dangerous (see above dire warning about exploding lithium cells), and I would not have done so if it wasn't for my safety equipment and experience with lithium cells. Please, please, please, do not try to disassemble your battery! I don't pull punches with batteries or battery vendors, and I didn't intend to judge this battery by its casing alone. I wanted to see what was inside, but neither the tail cap or the head cap were budging. That's why I broke out my jewelry saw and with the utmost care, cut the casing apart! So what did my ten dollars, hour of nerve-wracking slow sawing, and wanton disregard for my own health and safety reveal? A pretty great design! 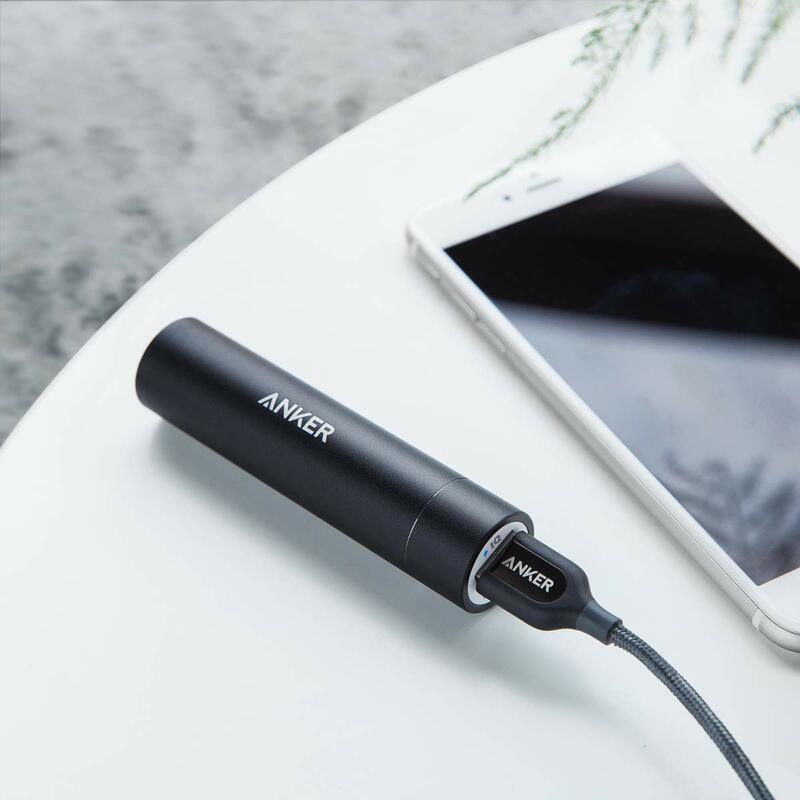 Anker's PowerCore+ casings are threaded at both top and the bottom instead of press-fit, which means simply dropping this will not crack any part of it open, regardless of drop height. They've also sealed the threads with what appears to be cyanoacrylate glue (fancy way of saying super glue) which means you won't even be able to wrench it apart with vise grips if you tried (I did). Being well-versed in the 18650 cells that Anker uses, I knew there would be little to no "dead space" inside, but I was able to confirm how tightly everything was designed once I got the tail cap off. Eventually I was able to saw off the rest of the casing without putting a scratch on the battery cell itself, and was able to reveal a Panasonic-Sanyo NCR18650BF cell soldered to a small DC boost converter PCB and USB ports. The NCR18650BF cell is a beauty of a battery cell, and represents one of the highest capacity and quality cells available on the market today. 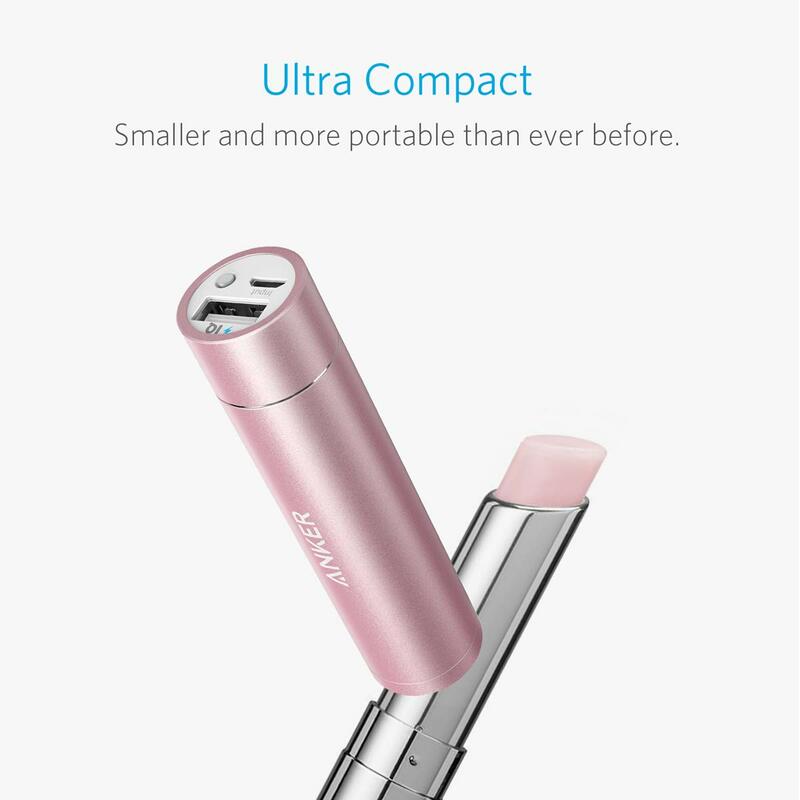 It has a nominal capacity of 3350mAh / 12.06Wh at time of manufacture, with a maximum continuous discharge rating of 3.63A, which is more than enough for this particular application. It's older brother, the NCR18650B, has a similar capacity but sports a 10A max continuous discharge, which is overkill for this application. Technically Sanyo also now makes the NCR18650GA cell, which boasts an industry-leading 3500mAh, but this is a negligible bump in capacity that would result in a not-so negligible bump in cost. This is also the reason why I have mentioned the cost so many times in this review. I had to know what cell was inside. Most reputable outlets will sell just the NCR18650BF *alone* for 9.99USD. 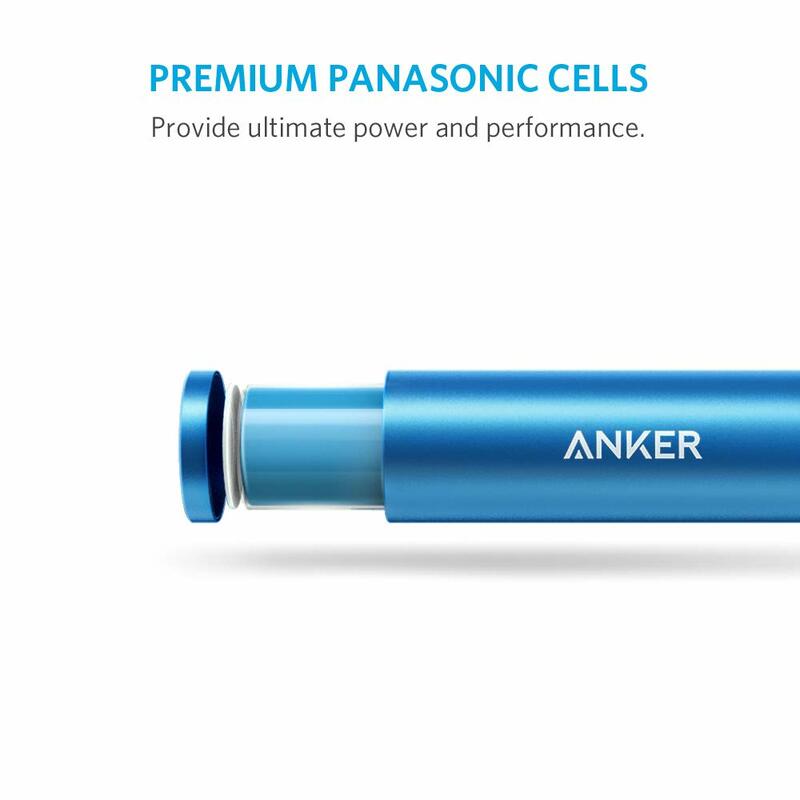 That Anker uses this cell and still manages to manufacture and ship everything else with enough room left in the margin to sell it at 9.99 and not lose money, is nothing short of a miracle, and it is what prompted this review. I did also have a look at the DC circuitry, and was impressed as well. Most phone accessories that I've repaired or inspected have had laughably poor design and manufacturing quality. Anker's DC board appeared to be well thought-out and laid out, and had solder welds of excellent quality, which is embarrassingly enough the thing that most vendors manage to screw up. The DC electronics appeared to be split into two boards. One for the battery protection and charge circuit, and the USB Boost Converter on another circuit, mounted perpendicular to the first. 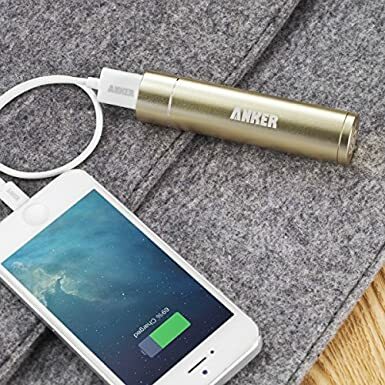 This was a smart design choice as it allows Anker to make revisions to each board independently of the other, and provides them with more flexibility in the long run. Not that it matters to most Amazon buyers, but my battery protection circuit had a marking of "7913P-2-V1.1 14.12.04", implying that it was revised December 4th, 2014, while the USB PCB was marked "13.11.29 7913P-1-V1.1" which implies that it was designed over a year prior to the former. Anker claims to use "high quality US-made IC's" in their products and I don't have an easy way of refuting this. None of the IC's bore any logos or enough information for me to identify the part without dissolving the chip in nitric acid and putting it under a microscope, but based on the rest of the build quality, I have no reason to doubt them on this point, although I would argue that it should probably read "US-designed", as very, very, very, very few chips are actually still manufactured in the US, with the exception of those intended for military or government applications. This is the most important part, eh? Alright, let's dive in. Second rule, batteries age. They age just by sitting there, doing nothing. They age even faster when you actually make them DO stuff. Third rule, most specifications are useless. mAh by itself is not an actual measurement of energy, although everyone and their dog treats it like it is. If your battery was a tank of water, the mAh rating would be akin to saying how many hours you can spray water for, but not telling you how big the tank is. You would have an extremely vague idea of of how much water you can hold, but not a real figure. It's a poor analogy for it, but the detailed explanation would add even more text to an already ridiculously long review, so if you want to read up more, please do so at your favorite search engine but in the meantime, let's just say that we only care about Wh, or Watt-hours. Every battery cell has two capacities. The "Nominal" capacity, and slightly lower "Minimum" capacity. Everyone only uses the first number in marketing. Everyone. What this means is that "12.06Wh" capacity that you see on the product is only true for a couple of weeks right after Panasonic made the battery cells. By the time those cells are stored, sold to Anker, then stored again, used in manufacturing, stored again, shipped to Amazon, stored again, and then eventually shipped to you, these cells have a usable capacity of around 11.52Wh to 11.70Wh, which is actually what is reflected in the official datasheet for the NCR18650BF. 12.06Wh is just the NOMINAL capacity and in real-life you never see that. So why does everyone use the nominal capacity? Because it sounds better, and technically speaking, it was true for at least a couple days, long long ago. So I started at the bare metal, the lithium. I ran the NCR18650BF cell just by itself against a load of .2C or .67A and a cut-off voltage of 2.50V, the same test that Panasonic uses to get their original rating, and got a capacity of 11.4834Wh, which is just slightly under the "Minimum" rating for the cell, but it's close enough that I can't fault Anker for it. 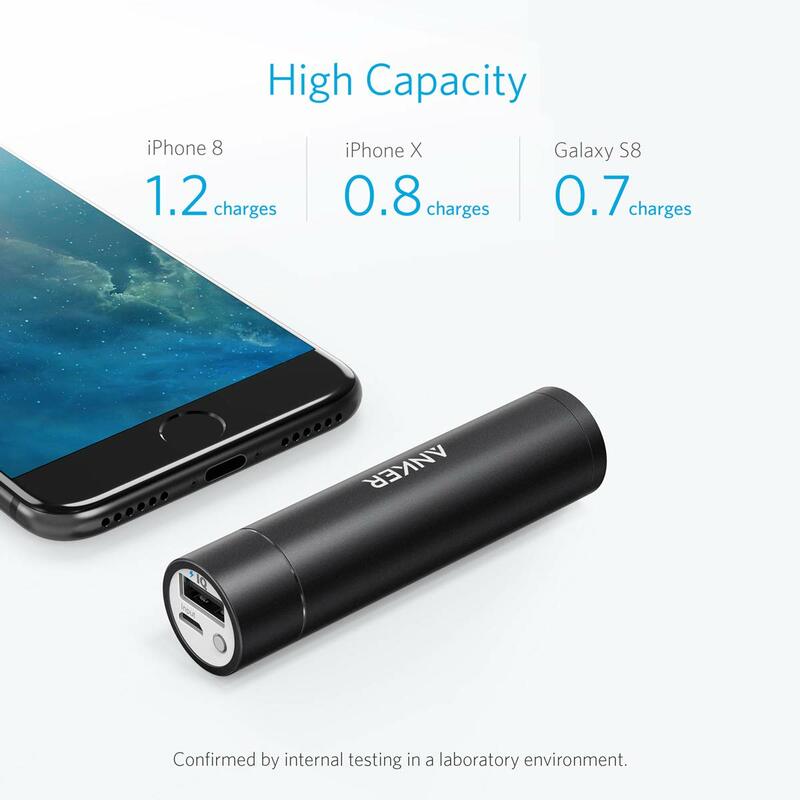 This is the real-world, best-case, available capacity of the cell before it goes through any other losses, such as those introduced by the DC/DC conversion up to 5V, before the voltage drop in your USB cable, and before the conversion losses in your device as it charges the internal battery. We're already starting the race a with a handicap, but everyone has a similar handicap. 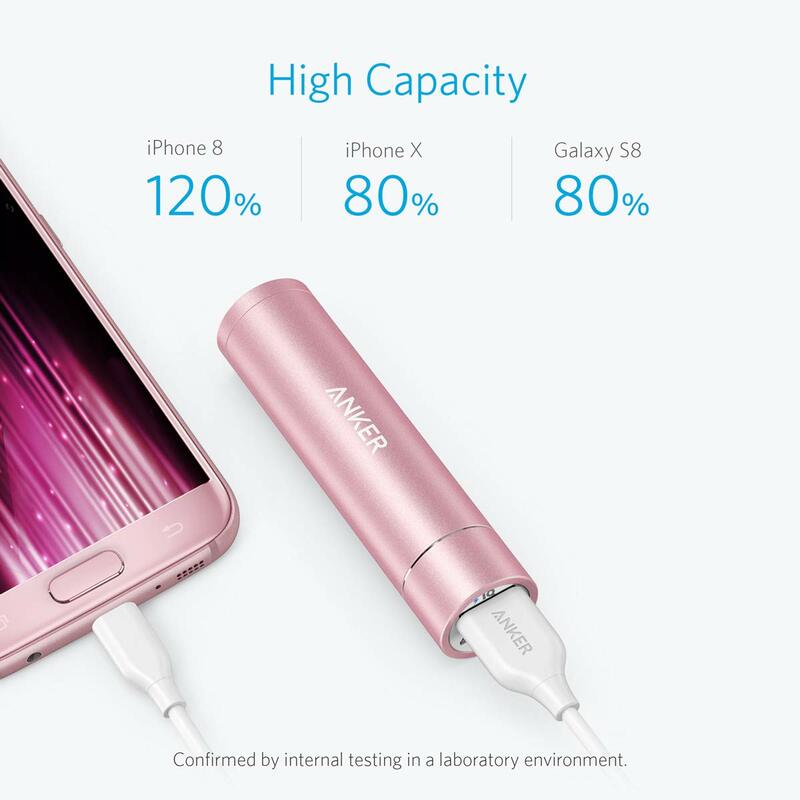 Anker claims 90% efficiency with their DC converters, but since they do not publish their testing process or procedure it is impossible to know under what ideal conditions they performed their tests. What is clear however, is that however great their design is, it fails to meet 90% efficiency in the specific battery that I took apart. 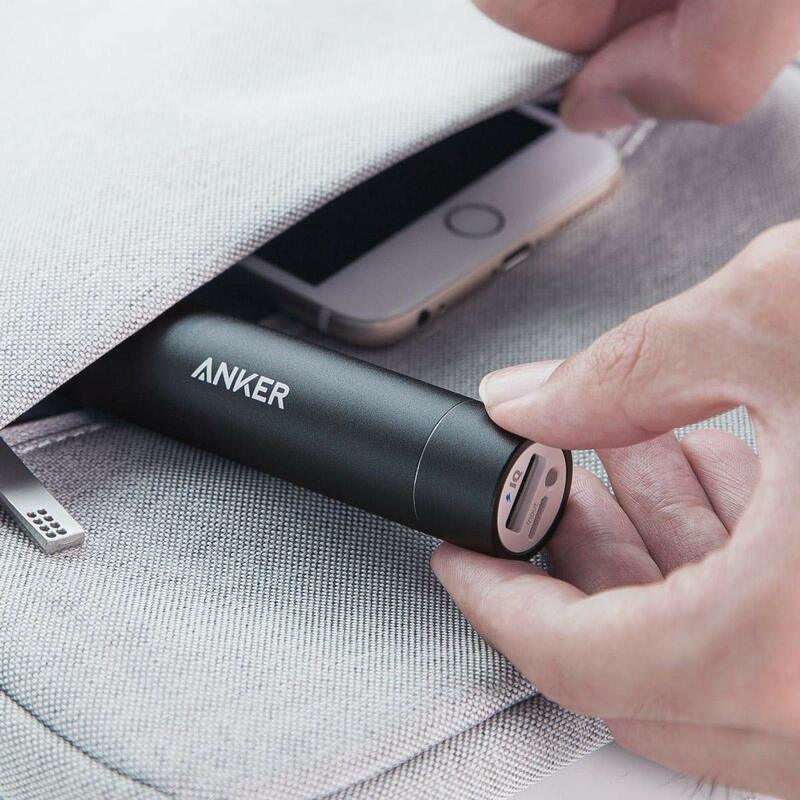 Based on conversations with Anker, they are constantly updating and making changes to their designs, which is great, but because these changes aren't publicly tracked and because the batteries are sealed, there is no simple way to know what the characteristics of your battery are. 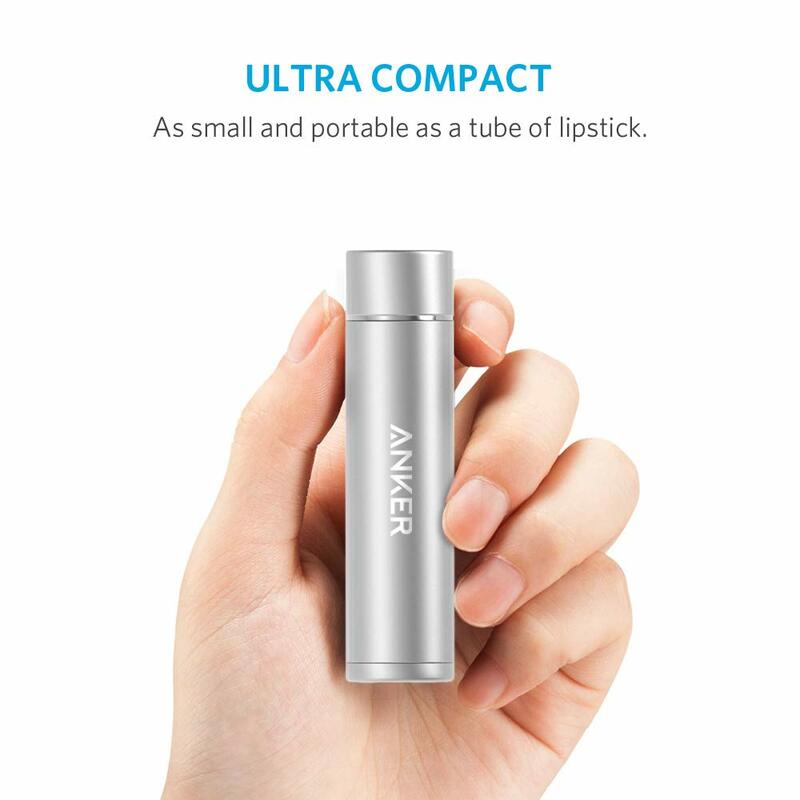 It may sound like I am being harsh with Anker, but I am not. 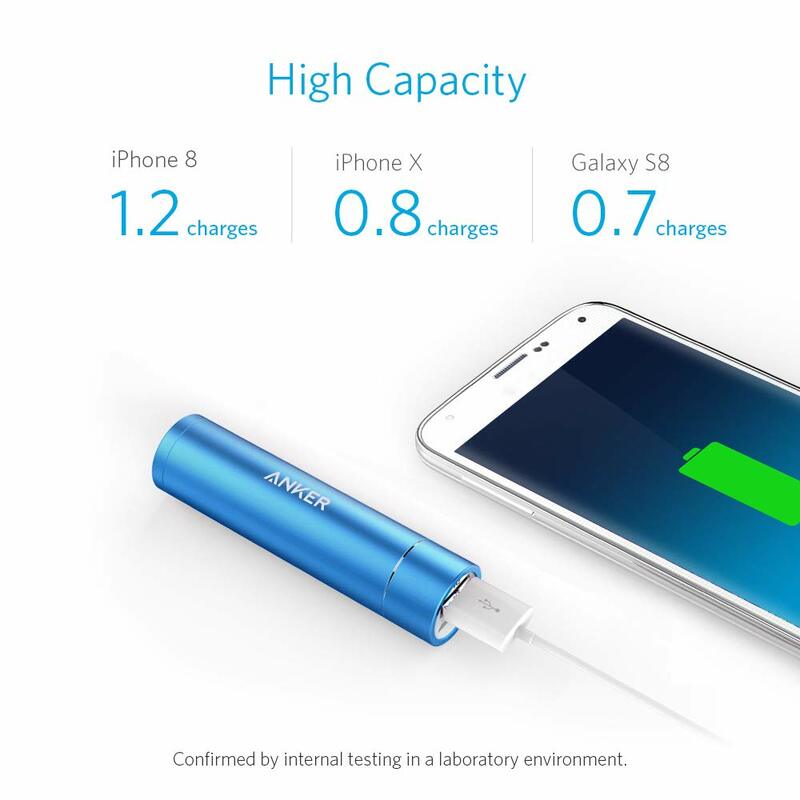 These are simply the facts, and the truth is that in my experience most of Anker's competitors are far worse. The point of this breakdown is to provide some real-world data on a product. Something else that I observed on the Astro Mini that I took apart (we'll call it "Unit A") is that the USB circuit was prone to overheating. While it didn't prevent the unit from working, it did reduce the power output and decrease efficiency as it heated up. I verified this by using Freeze Spray, and found that a short blast of freeze spray dropped the temperature instantly and restored efficiency back to the numbers above. It bears noting that so far all of the tests that we have discussed were performed on a battery that was labeled as "Astro Mini" and it is possible that my battery was manufactured during the early stages of the production shift. The rest of the batteries, units B through D, all exhibited different qualities that as I will discuss later, but I did not cut any of those open since I wanted to limit how much I was spending out of pocket. Remember the first capacity test I did? It was only run at .67A because that's the rate that Panasonic-Sanyo used for measuring the published capacity of the cell. That capacity will be lower when drained faster and as you can see above, in order to charge your device at 5V @ 1A, the drain on the battery cell is more than twice that. Since modern lithium cells have a stated nominal voltage of 3.6V, I used the current draw of 1.637A and cut-off voltage of 2.50V to re-assess the capacity of the bare NCR18650BF cell to determine the actual available capacity at the higher drain rate. Result? 11.08Wh. So as you can see, using the cell as intended we've already lost about .40 Wh of energy capacity before we even touch the losses in the boost circuit, and that's assuming a cut-off voltage of 2.50V! In my testing I found that when drawing 5V @ 1A the boost circuit cut-off and shut down when the cell voltage dropped to approximately 3.20V, which means we're still leaving some Watt-minutes on the table. How many? These tests were all performed with the batteries fully sealed, assembled, and as they came directly from Amazon. In total, I tested four batteries, two of which were marked as "Astro Mini", and two of which were marked "PowerCore+ Mini", all of which were marked 3350mAh/12.06Wh. All of them were ordered as "PowerCore+ Mini" from Amazon. They were all designated Units A through D.
For the testing procedure, I charged each battery through the USB Micro port per the instructions from Anker until they were full. I then connected each battery to the electronic load and programmed the load for a constant current draw of 1.000A, and measured the output voltage ten times per second until the battery died. Each test was performed three times and the results were averaged. The results were beyond interesting to say the least, as no two batteries performed alike. Discharge remained flat and stable until the battery was approximately 75% depleted, at which point the voltage became unstable and dropped significantly. Based on the erratic behavior of the drop I believe the boost circuit began to overheat as it tried to cope with the lower input voltage of the battery cell. Discharge failed to remain flat after approximately 10% capacity used and declined consistently and rapidly through the complete discharge cycle. The relatively smooth discharge curves indicates a failure of the boost circuit's design to maintain 5V @ 1A. Based on observations with Unit A it is possible that overheating contributed to this, but since I did not cut open the exterior casing this is just an educated guess. Discharge remained extremely flat through the cycle and output voltage increased slightly as charge was slowly drained. 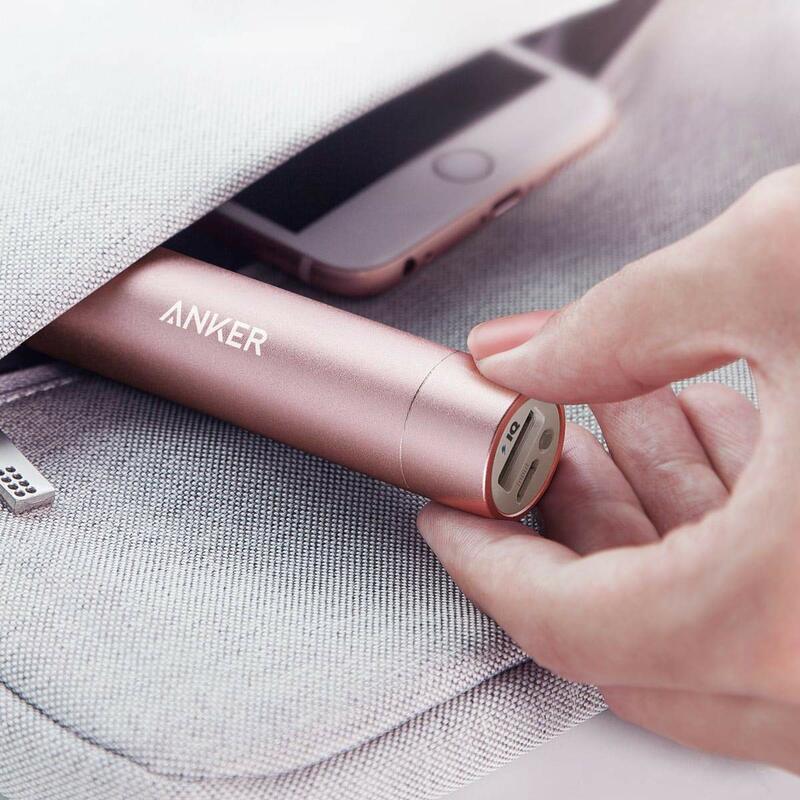 Based on conversations with Anker this is likely due to Anker's "Voltage Boost" feature which provides a slightly higher output voltage in order to compensate for the loss in the USB cable. While this does provide a slightly faster charge, it also results in a slightly lower available battery capacity, although this small discrepancy alone does not account for the near 1Wh difference between Units C and D.
Out of all four batteries, Unit D exhibited the best performance. The output was not only super-flat through the discharge cycle, the available capacity tipped the scales at 9.578Wh @ 1A draw, which was better than any other of the batteries that I tested. Interestingly enough, the "Voltage Boost" feature appeared to be absent from this particular unit, as well as units A and B. So what does all this mean? First, it is important to note that I was using a programmable load for testing, and not a device. 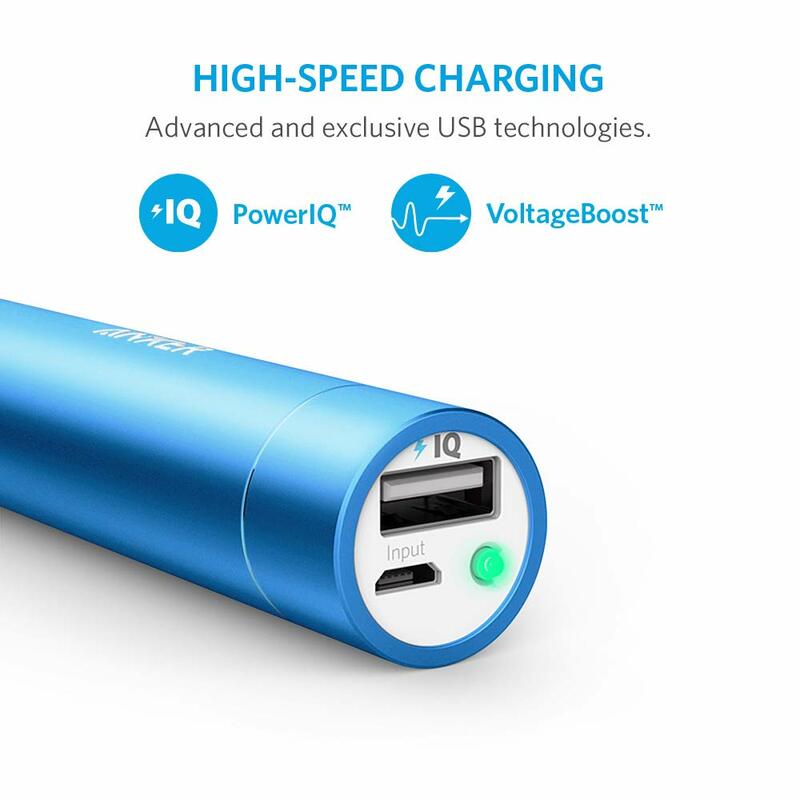 In actual usage, your device is always going to try to draw 5V, and if the battery can't maintain it, the current output will drop, resulting in a slower charge rate. I would also like to make clear that charge rate and battery capacity are completely independent of each other. 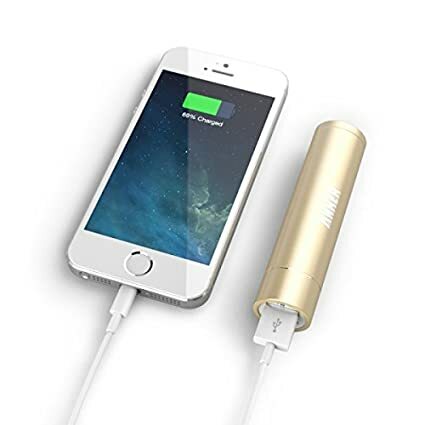 While charging a device as fast as possible might be the most important thing when connected to a wall outlet, that may shift when one starts to think about how a portable battery is used. Personally, I would much rather have my phone take a few more minutes to charge to a higher percentage, than to charge much faster to a lower one. On 11/23/2015 I forwarded my results to Anker Support along with relevant purchase dates, serial numbers, and other information they requested. Anker followed up with me later that day, and explained that not only were the Astro Mini units possibly shipped out to me because of a fulfillment error in the system, but that at least one of them, possibly both of them, may be "defective". I'm putting defective in quotes here because this is an issue with a lot of grey area. Batteries in the real world are not an exact science, and there is a "range" that is considered normal. Even though the results may look bad when the data is presented the way I have presented it, without knowing the design intent it is difficult to know if the problem is really a defect in manufacturing, poor quality control, over-eager marketing, or some combination of these issues. 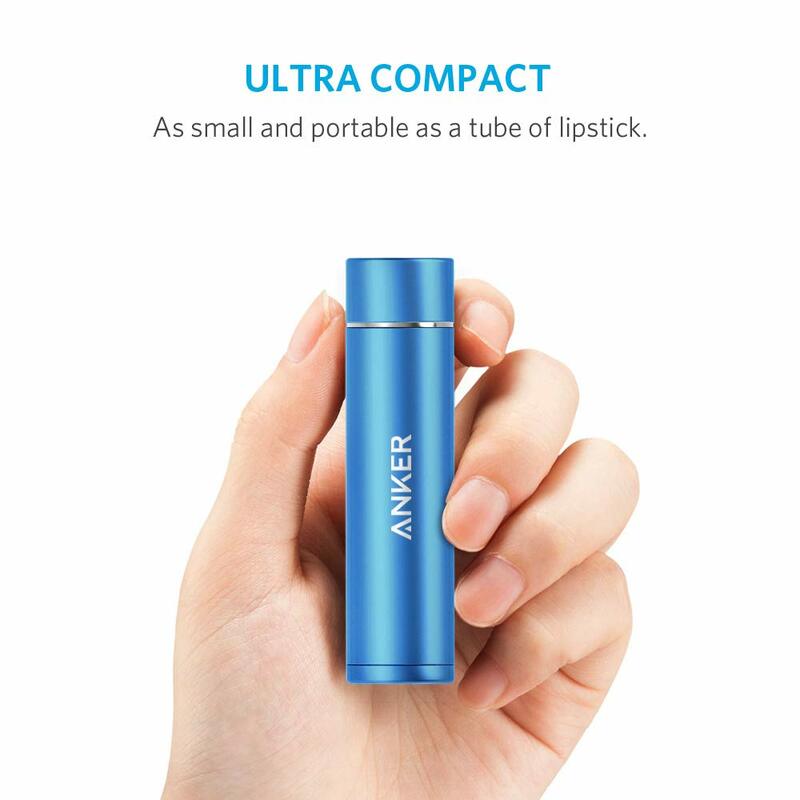 The Anker representative advised that they would replace Units A and B with new PowerCore+ Mini's from Amazon's inventory because of the order-mix-up and possible defects. When I pressed for more information about why there would be a nearly 1Wh difference between the other two batteries I had, Units C and D, and why one of them appeared to have Voltage Boost but not the other, I was advised that they would send a message to the Product Management team and get back to me. 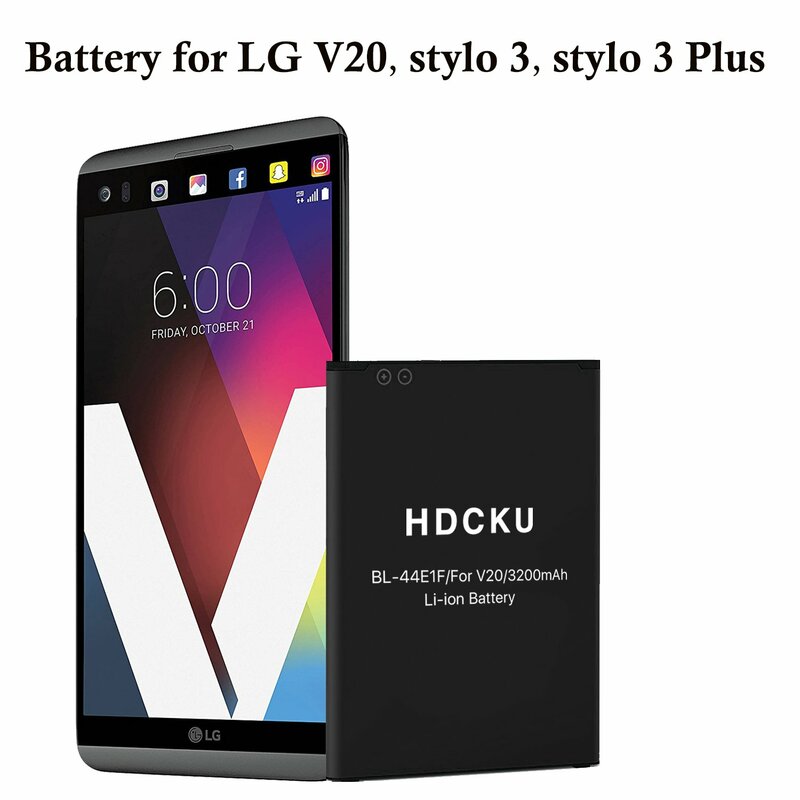 This review will be updated with that response when if and when it is received, along with additional capacity measurements for the replacement batteries I receive. Not all USB cables are created equal, and I'm not just talking about how they look or feel. When it comes to charging, the two most important factors that will affect your charge rate and efficiency are cable length, and conductor size. The longer the cable, the higher the resistance, the lower the efficiency. Thinner wires also result in a lower current carrying capacity, a higher resistance, and lower efficiency. So while that extra-long or extra-cheap cable might be really convenient while traveling or easy on the wallet, if you use it with an external battery you're throwing away capacity. In my preliminary tests of several cables I saw some of the worst cables reduce efficiency by up to 40%!!! 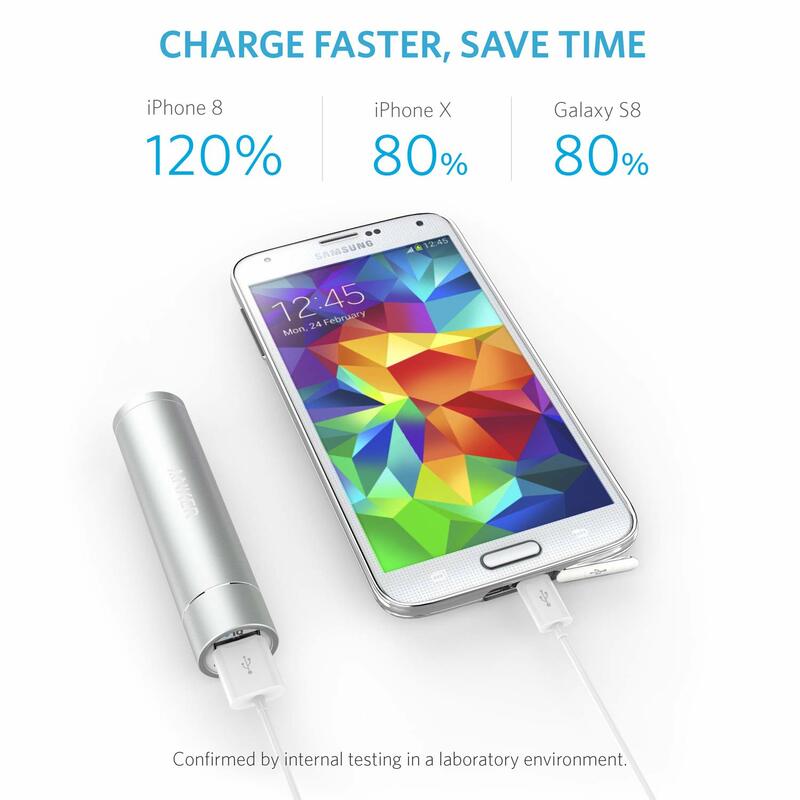 This is a ridiculous number, and it doesn't just mean slower charging. It means you're potentially throwing away vast amounts of battery capacity in your external battery pack by using an inadequate cable. 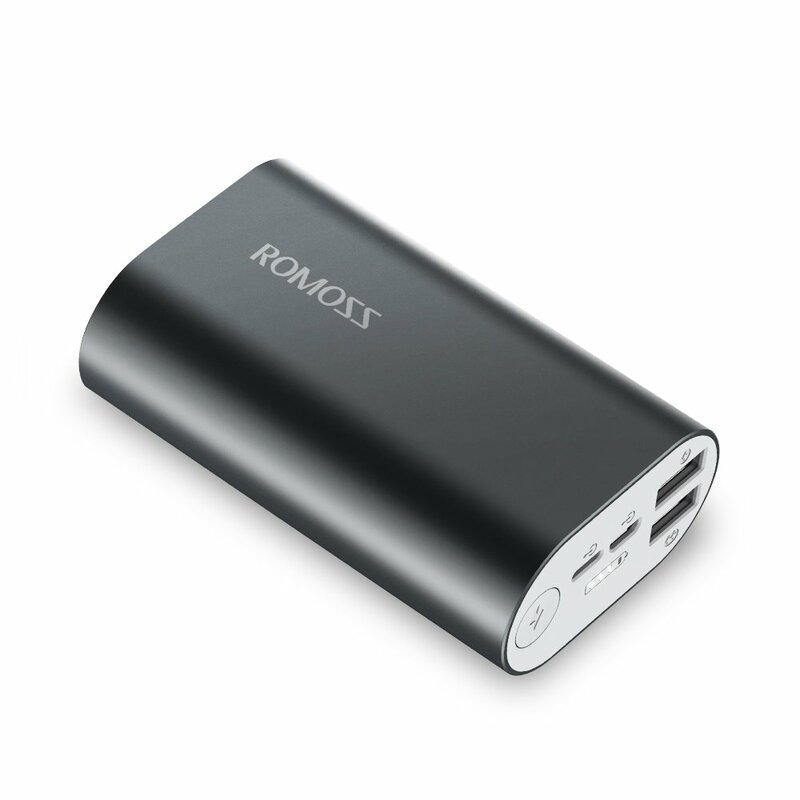 My recommendation, when using an external battery use the shortest cable you can get away with using comfortably. If that means you have to carry around two different lengths of cable, so be it. Don't waste your precious battery power! Finally, I've put a ridiculous amount of effort into writing up this review. [...] If you think something could make it better, leave a comment! 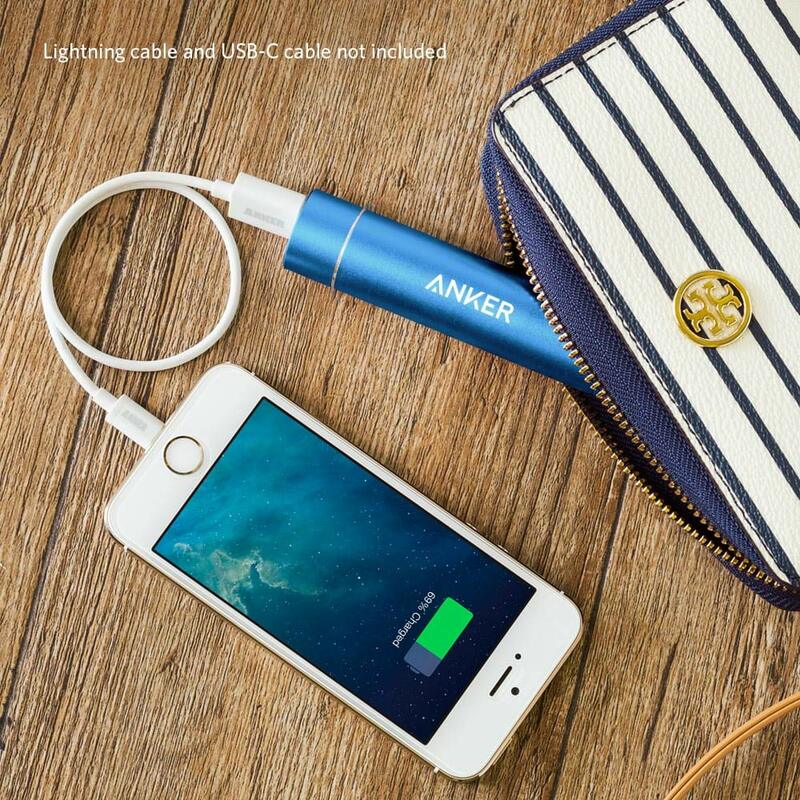 We are gathered here today to celebrate the life of our Anker PowerCore+. We received it in December with such joy however, it passed away by June. Our Anker was there every time our iPhone's battery indicator hit below 10%. It was always there, ready to charge. For those seven months, it was one of the best friends a guy could ever have. And boy, did it charge until that fateful day during the last week in June. 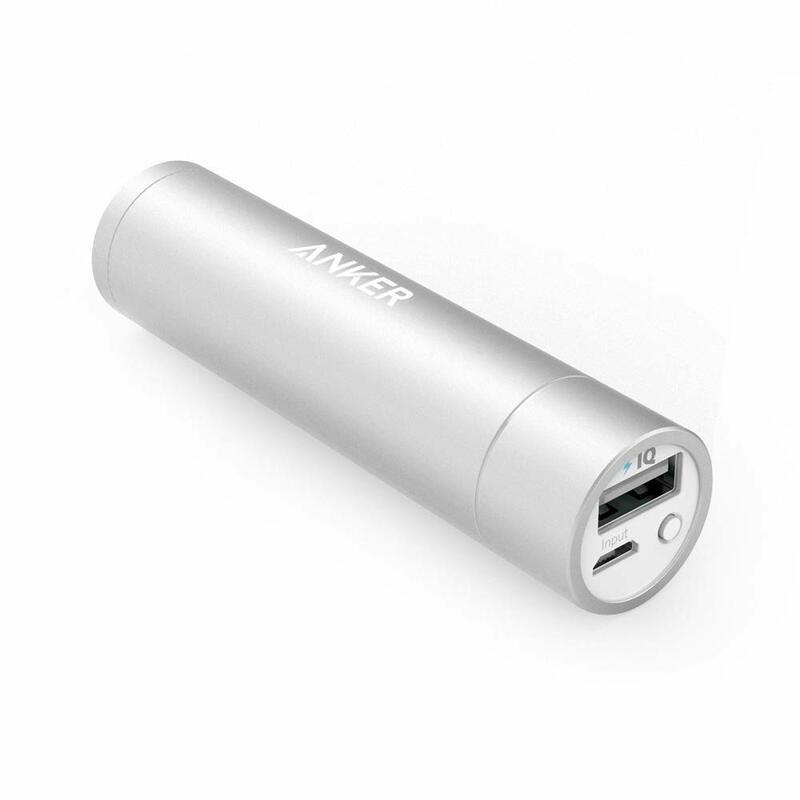 Anker is survived by his older brother (also a PowerCore+), who was purchased in September and is still going strong. We will probably purchase another one because, you know... $10 bucks. So what, right? Three stars because of battery life otherwise, four. 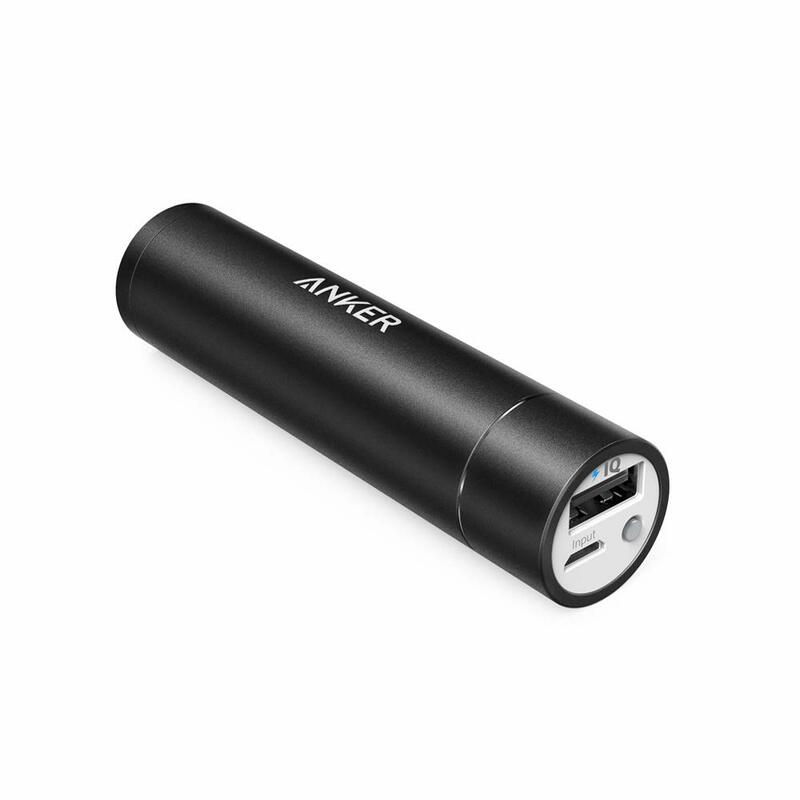 Anker contacted me and replaced the PowerCore by sending me a new one. Added one star for customer service awesomeness. I bought a couple of these a while ago and now I'm picking up a couple more as gifts. Anyone who has a smartphone should have one. I was thinking of ideas to protect these from water and debris in my pocket or backpack. The simplest idea I came up with was to pickup some rubber chair tips at the hardware. Size 7/8 to 1 inch. They fit perfectly and do a good job of protecting them. 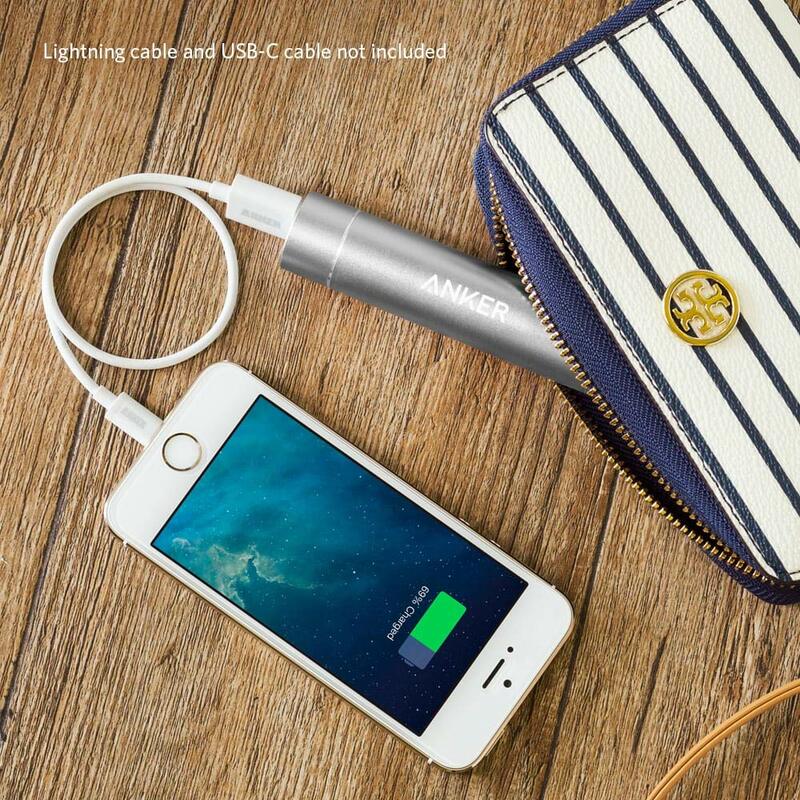 Anker hit a home run with this product. Five stars. I must preface my review of this product by explaining my purpose in purchasing it. After traveling to Asia for over 50 years, I can no longer carry tons of luggage. In celebration of my seniority of 70 years, I am making my next two-month trip with just a small Marmot backpack and an Eagle Creek Load Hauler Expandable duffel. Both packs qualify as carry-ons, which also means no waiting at baggage carousels and no lost bags! Packing weight and compactness is my primary motivation for anything I take on the next trip. I have a three-year-old Anker Astro E7 26,800 mAh charger, which works great but weighs a tenth of an ounce under one pound. 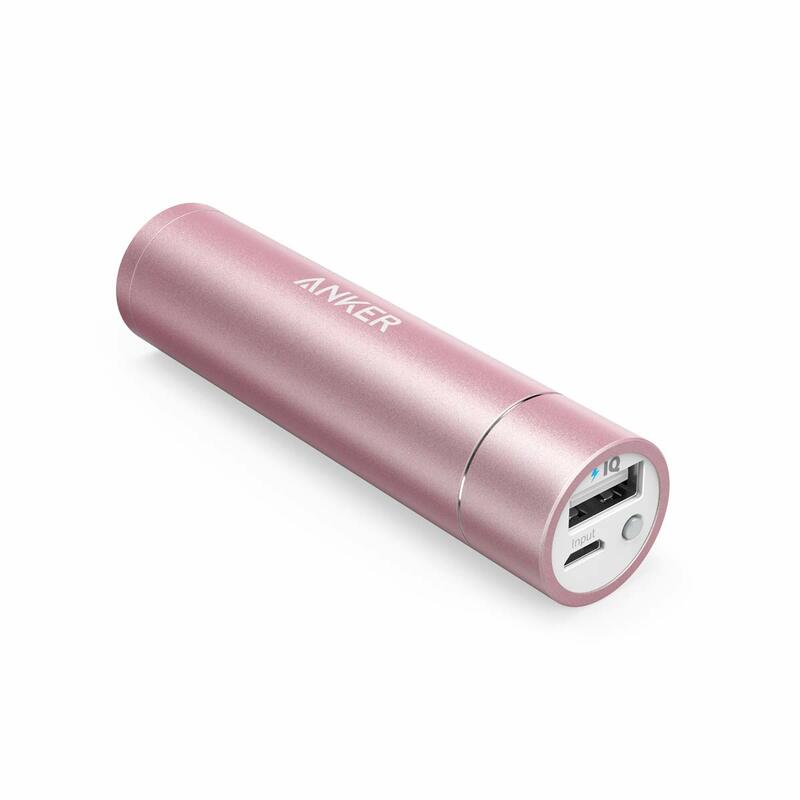 One extra pound is too much for this trip, so I chose the Anker PowerCore+ Mini 3350 mAh lipstick charger, which weighs around three ounces. I started charging my iPhone X at 9 AM, which was indicating the handset was down to 14% charge. I used a genuine Apple USB - Lightning cable. Two hours later, the iPhone X was up to 86% charge and the PowerCore+ went from solid red lights to flashing red lights, indicating the PowerCore+ was about dead at 5%. At 11:03 AM the PowerCore+ Mini 3350 indicator lights stopped, indicating that charging had stopped. 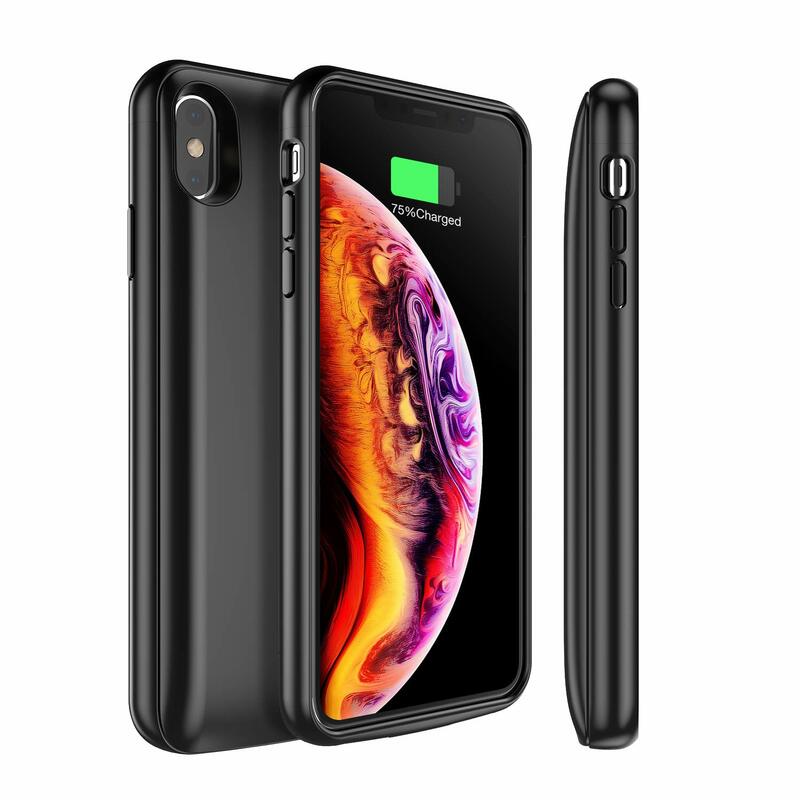 The PowerCore+ Mini 3350 was depleted and the iPhone X was at 89% charge. By my calculations, the PowerCore+ Mini 3350 was overrated by a considerable amount of power. I only got 2,417 mAh of power from an Anker product rated at 3,350 mAh! Hmmm, 75% charge. This was only the second full charge on the phone X and the first time the PowerCore+ Mini 3350 was used to charge anything. But wait! Perhaps my test was flawed. 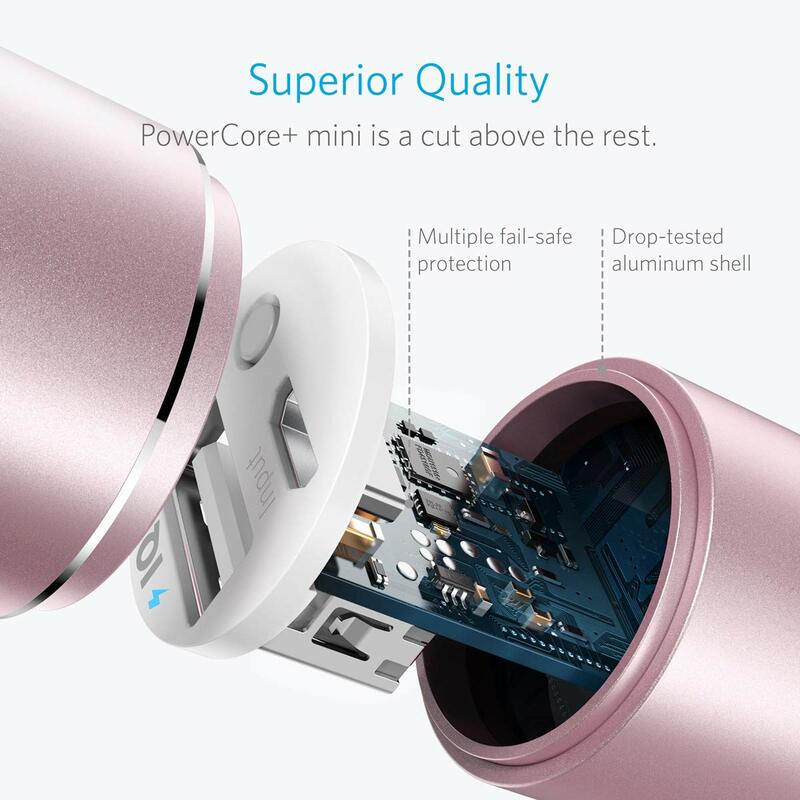 Is it possible from the time the PowerCore+ Mini 3350 was manufactured, initially charged and shipped, it had lost considerable power before I used it? 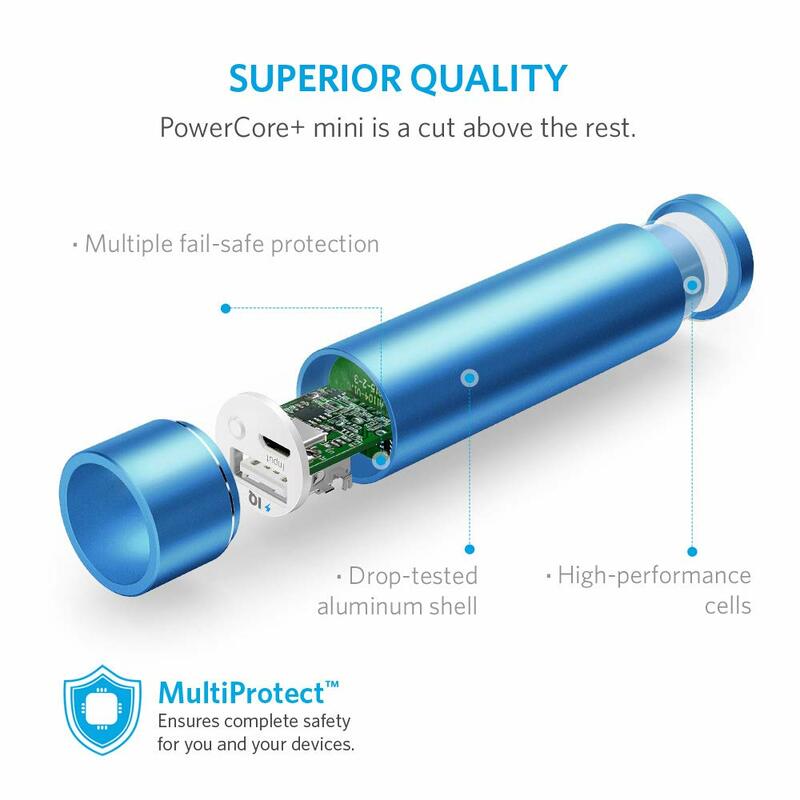 Did the manufacturer fully charge the PowerCore+ ? I pulled out my iPhone 6S Plus that has a battery rating of 2,915 mAh. After charging my PowerCore+ Mini 3350 back up to 100%, I then connected it to the iPhone 6S Plus at 4:13 PM. Two hours later, at 6:15 PM the handset was at 88% charge, and the indicator light on the PowerCore+ was still yellow. 6:29 PM 91%. 6:46 PM 94%. At 7:01 PM, the red indicator light on the PowerCore+ came on with the charge on the iPhone 6S Plus registering 96%. At 7:45 PM, the handset was fully charged. About the same time, the PowerCore+ red light turned off, indicating its internal battery was depleted. I think I can say that you will get at least one full charge from a handset that has at least 14% charge left. More important, many people on Amazon ​and other sites leave poor reviews based on flawed testing. 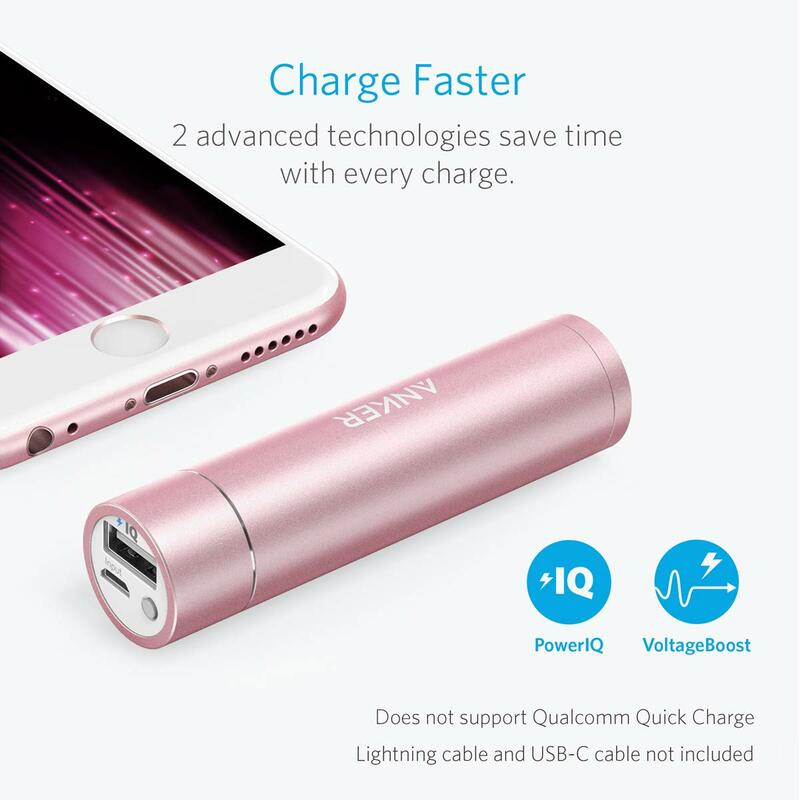 I was looking for a charger that would provide me with one full charge after my handset’s battery was almost depleted. The PowerCore+ delivered, so it gets full marks. Lessons learned; pack light and fully charge!